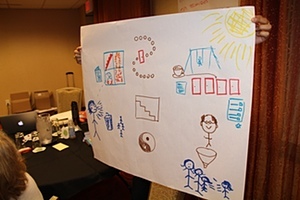 SERIOUSLY FUN ACTIVITIES FOR TRAINERS, FACILITATORS, PERFORMANCE CONSULTANTS, AND MANAGERS. Our mission statement, copyright notice, and cast of characters. List, Compare, Draw, and Act. Five for the price of four. Albany, New York in June. 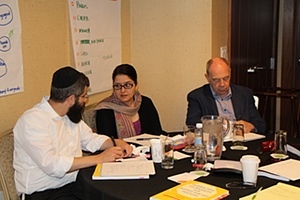 Our most popular workshop in four more cities. A link to the latest issue of Brian's newsletter. Is there an all-purpose training objective? How Authentic Is Your Training? A summary of your responses. To increase and improve the use of interactive, experiential strategies to improve human performance in an effective, efficient, and enjoyable way. Reprinted from THIAGI GAMELETTER. Copyright © 2013 by The Thiagi Group, Inc.
For any other use of the content, please contact us ( thiagi@thiagi.com ) for permission. 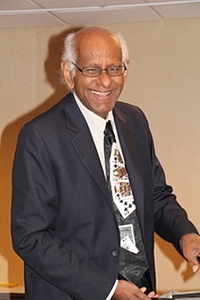 To sign up, or to donate and help us continue this newsletter, please see the Online Newsletter page on our website ( http://thiagi.com/pfp.html ). Thiagi believes in practicing what he preaches. This is an interactive newsletter, so interact already! Send us your feedback, sarcastic remarks, and gratuitous advice through email to thiagi@thiagi.com . Thanks! We have been play-testing and tweaking this card game (under different names) for the past 30 years. Most of our continuous improvement tweaks involved simplifying the play of the game. We are happy with the current version because it provides an engaging and fast-paced activity. The goal of this card game is to increase the fluency with which the players are able to handle concepts, principles, and procedures associated with a specific training topic (such as trust, feedback, motivation, coaching, or leadership). The game does not deal with factual information or technical jargon. Nor does it review the content of a specific training workshop, a best-selling book, or a popular conceptual model. The game rewards the players for the knowledge of the topic without bothering about where they acquired it: from reading books, attending workshops, or acquiring street smarts from tough experiences. The game uses a deck of cards, each with an appropriate item for the players to handle. There are four suits of cards (just as in the case of regular playing cards), each with a specific type of items. To win a card, the player has to perform a specific task. At the end of 10 minutes of play, the person who has collected the most cards wins the game. Three players play the game. It can also accommodate four or five players. Larger numbers of players can be divided into several playgroups for parallel play. Players take turns to be the judge during each round of the game. During his or her turn, the judge turns over the top card of the shuffled deck. The judge cannot win the card; the other two players compete to win the card. A different sub-game is played with each of the four suits of cards. These sub-games require the players to perform different types of tasks. The judge decides who won the round and gives the card to the winner. List. Each of the 13 spades cards contains the name of a category. (Example: ♠10 in the Customer Service deck displays the category words and phrases that customers like to hear .) The two competing players take turns to announce an item that belongs to the category (example: discount). The judge listens to these items until one of the players hesitates too long or repeats a previous item. When this happens, the other player wins the card. Compare. Each of the 13 clubs cards contains two related concepts. (Example: ♣2 in the Feedback Techniques deck displays downward feedback and upward feedback.) The competing players independently write one major similarity (example: both give information about a behavior of the other person) and one major difference (for example, downward feedback is traditional while upward feedback is unconventional) between the two concepts. After a suitable time limit, the judge collects the two sets of responses, reads them, and decides which set is the better one. The author of this set wins the card. Draw. Each of the 13 hearts cards contains a single concept. For example, ♡2 in the Presentation Skills deck displays the word humor.) The competing players independently draw a picture (example: several smiling faces or a clown) that is strongly associated with the concept. The judge studies the two pictures and gives the card to the artist who drew the more meaningful and memorable one. Act. Each of the 13 diamonds cards contains a scenario for a roleplay. (Example: ♢3 in the Managing Globally deck displays a primary role [Vice President], a secondary role [Manager of Asian Division], and a situation [to give constructive feedback without making the other person lose face]). The person on the judge's left takes the primary role. The other person takes the secondary role. The judge watches 2 minutes of the roleplay and decides if the primary player did an effective job. If so, this actor gets the card. If not, the card is set aside. The same games can be played with different decks of Fluency Cards . We currently have 13 different decks dealing with various corporate training topics. We are working on several more topics. This is another one of our counter-complacency jolts. It warns you against feeling smug about your successes and reminds you that what worked earlier may not work now. 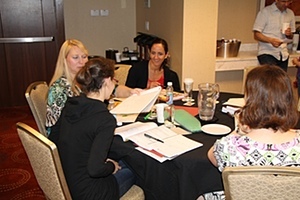 Participants review a series of numbers and determine what number comes next. The first two series can be analyzed through mathematical thinking. The third series, however, requires an entirely different type of reasoning. To think logically and laterally. 1, 4, 7, 0, 3, 6, ? 0, 9, 1, 8, 2, 7, 3, 6, 4, 5, 5, ? 8, 5, 4, 9, 1, 7, ? Instead of wasting flipchart paper, you can go green and prepare PowerPoint slides with each of these series. Present the first series puzzle. Ask the participants to study the numbers in the series and to discover the pattern among them. Invite them to yell out the next number. If necessary, announce the answer (9) and challenge the participants to discover the number that comes after that. Explain the first pattern. Congratulate the participants for using their logic to discover the next number. Invite them to explain the pattern. If necessary, clarify that each number is three more than the previous one. If the resulting number is greater than 10, subtract 10 from the answer to give a single-digit answer. Present the second series puzzle. Ask the participants to study the numbers in the series and to discover the pattern among them. As before, invite the participants to yell out the next number. If necessary, announce the answer (4) and challenge the participants to discover the number that comes after that. Explain the second pattern. Congratulate the participants and ask them to explain the pattern. Wait for the responses and clarify that each pair of numbers adds up to 9. Explain the pattern. Congratulate any participants who have solved the pattern. Explain the pattern: The numbers are listed in alphabetical order in English! Explain the concept of negative transfer. Point out that the first two puzzles required mathematical thinking while the third one required language-based thinking. Suggest that the success of the first two attempts encouraged people to find a mathematical solution, instead of looking for alternative approaches. Invite the participants to come up with their own examples of initial success discouraging flexible thinking. Try alternative approaches to problem solving instead of rigidly following the approach that worked successfully in the past. You can mix and match the five decks. You can buy five different decks or several copies of the same deck (to play with large groups of participants or to give as gifts to your colleagues). This offer is valid only during the month of July. Order by July 31, 2013. To take advantage of this discount, visit our online store. Order five or more Fluency Cards decks and enter TGL-FC5 as the coupon code when you check out. We will give you a $49.95 discount on the total of your order. We will add $9.50 per deck for shipping to USA addresses. If your address is outside the USA, the shipping charge will be higher. We will email you how much it will cost before we ship the cards to you. On June 18th, we conducted the first in the series of our US Interactive Techniques for Instructor-Led Training workshops. The workshop (in Albany, NY) had participants from all over the Northeast, including several folks from Montreal and Toronto. We had independent trainers, corporate trainers, and not-for-profit trainers. 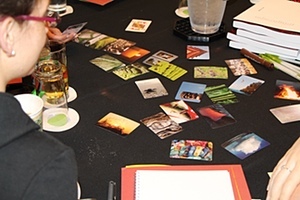 The group enthusiastically explored different training activities including openers, closers, jolts, textra games, puzzles, structured sharing activities, interactive lectures, simulations, interactive storytelling, improv games, magic, and more. For participants' insights into this workshop, see this video: https://www.youtube.com/watch?v=oRu93zC0tAY . For the past 20 years, Interactive Techniques for Instructor-Led Training has been rated by participants around the world as one of the best training-design and -delivery workshops. Based on local demand, Thiagi and Matt are happy to announce that they will present this workshop in four more US cities in 2013. HOW MUCH: Regular registration rate: $1600. As a reader of the Thiagi GameLetter , get $200 off by entering coupon code TGL-WS13 when you register online. FOR MORE INFORMATION Watch this video: http://www.youtube.com/watch?v=m9lJvilwIoU . MORE INFORMATION: Review the brochure (1.2M PDF). Thiagi and his associates are happy to announce these workshops outside the USA. Check our online calendar at http://thiagi.com/calendar/ for details. Singapore: September 2-4, 2013. Interactive Training Strategies . Singapore: January 9-11, 2014. Interactive Training Strategies . Assumptions can get us in trouble but not if we let them hang out for others to see. You can use a new table top game to get your team talking about their hidden assumptions, work-life balance, and many other topics. Find out how you can use Suspend as a metaphor to meet many of your team challenges. Power Tip: Hold your new idea up for examination so people can identify the context supporting it and decide its truth and relevance. Read more in the June 2013 issue of Firefly News Flash : http://www.thefirefly.org/Firefly/html/News%20Flash/2013/June%202013.htm . Recently, we have been debating whether there are any fundamental training objectives that should be achieved by all levels of employees from all types of organizations. We interviewed several clients and surfed the Internet in search of an answer. The top choices included training objectives in the broad areas of communication, customer service, performance improvement, leadership, and learning to learn. As a result of our exploration, we are now back to square one. We are not even sure if our original question was a legitimate one. We would like your inputs to settle our disputes. Are there some training topics that are indispensable to all levels of employees in all types of organizations? What fundamental training topics are the most useful ones for most organizations? In addition to listing the topics, please provide some justification for your choice of these topics. You may include your name along with your response, or if you prefer, keep it anonymous. In the June 2013 issue of TGL we asked you to rate the authenticity of your training. Twenty-one people responded to the poll. No one confessed to a low level of authenticity; 57 percent rated themselves at medium level while 43 percent went for high authenticity. What suggestions do you have for increasing the authenticity of training? 6) Use more real examples, not sample examples. 5) To increase scenario authenticity, don't just settle for examples given by one Subject Matter Expert. Do more research, if time permits. Observe workers in action. Listen in on customer phone calls. And, perhaps most importantly, take time to run your scenarios by several other SMEs and members of your audience. Thanks to everyone who responded. This survey is still open. Feel free to add your comments by visiting the survey page. Connie Malamed is an accomplished and adroit thought leader in our field. Her work spans many areas that deal with how people perceive, comprehend, and interpret information. She is involved at the intersection of cognitive psychology, design, and communication. Her projects include online and multimedia learning, information design, visual presentations, website design, user interface design, user experience design, and other similar areas. Connie's second website is Understanding Graphics ( http://understandinggraphics.com/ ) It is an extension of her book, Visual Language for Designers . This blog covers visual communication topics and distills relevant research into digestible bite-sized chunks. Thank you, Connie, for consistently translating evidence-based principles into practical prescriptions.